Robin has rapidly traveled the high road to professional success. Today, he is the president and chief executive officer of AIG Hawaii Insurance Company, Inc. (AIG Hawaii), and several other entities in the industry. Because the insurance business is highly regulated and particularly susceptible to drastic changes through legislation, one of the biggest challenges ahead, Robin said, “is to be as adaptable as possible, to help prepare our company and our customers to deal with these changes.” And indeed, Robin has proven successful in leading his subordinates through dynamic transformations, enabling the organization to adapt to the volatility of the industry. 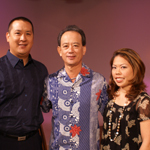 In recognition of his exemplary performance, Robin has received a number of accolades including Entrepreneur of the Year by Ernst & Young in 1999, Filipinas Magazine Corporate Leadership Achievement Award in 2001, Franklin Delano Roosevelt Award for Distinguished Community Service – March of Dimes in 2005, and Distinguished Alumni Award from the University of Hawaii, and Communications and Leadership Award from Toastmaster International both in 2000. Find out more about Robin Campaniano, the man at the helm of Hawaii’s largest writer of mass marketed auto insurance, here on Greater Good Radio. Listen now! 50th State Risk Management, Inc.